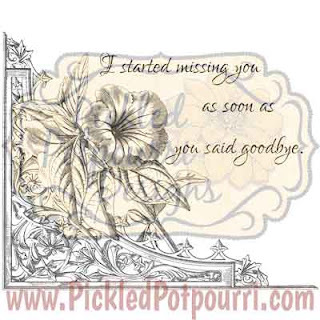 Pickled Potpourri has a new digital stamp in the store! The vintage ironworks frame cradles the lovely petunia - a perfect counterpoint to the sentiment: "I started missing you as soon as you said goodbye." Check out the rest of our digital stamps and other printables on Pickled Potpourri Designs - we have something for every style and project!